Known as the "The Queen of Herbs", tulsi is the most sacred herb of India. Tulsi has been revered in India for over five thousand years, as a healing balm for body, mind and spirit, and is believed to bestow an amazing number of health benefits. Tulsi, also known as holy basil, is thought to reduce stress, enhance stamina, relieve inflammation, eliminate toxins and improve digestion. Tulsi also provides a rich supply of antioxidants and other nutrients. 100% pure, biodynamically grown, organic Tulsi (Ocimum Sanctum), veg hydroxypropylmethylcellulose capsule. Take 2 vegicaps per day with food or as directed by a healthcare practitioner. 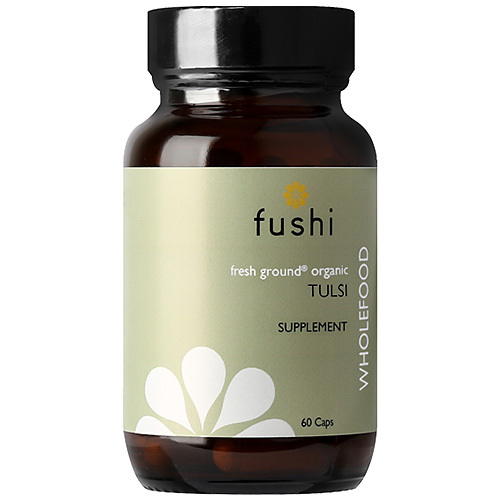 Below are reviews of Fushi Organic Tulsi - 60 Vegicaps by bodykind customers. If you have tried this product we'd love to hear what you think so please leave a review.